In the spring of 2011, the owner of Cruzan Creations, Kenny Lindquist bought a 1.7 acre property east of Christiansted. I was in the process of still trying to complete a move to Panama at the time, and he asked me to stay on St. Croix, manage this property as well as Cruzan Creations and our new retail division Life in the Left Lane®. I agreed to stay and began to clear the property that was totally overgrown. Over a four year period, I cleared the land of all but a couple of trees in preparation for some day starting construction. 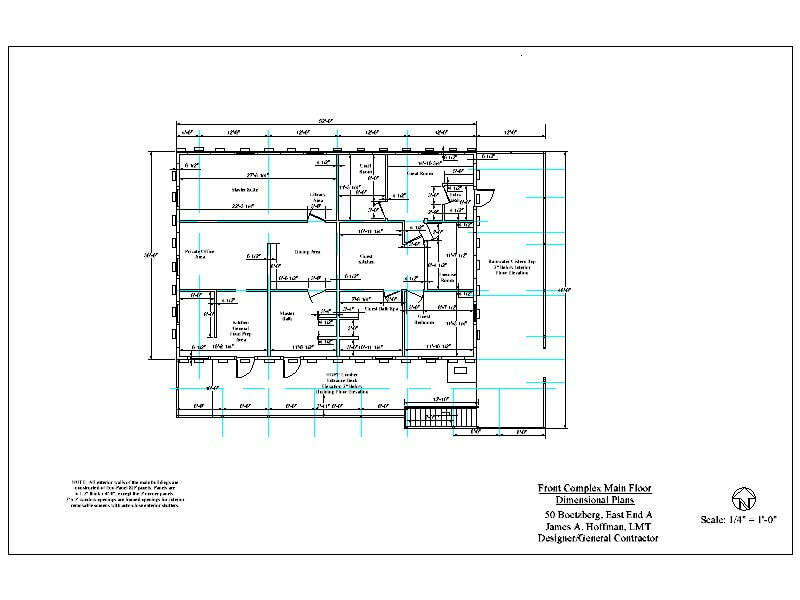 I am the designer and general contractor for the development of the acreage, as well as the property manager. I spend my "free time" mornings, when Mother Nature permits, at the property trying to keep at least the front complex construction area cleared of the Tan Tan trees. I'm slowly getting stumps from the initial clearing removed from the front area and digging out the guinea grass clumps. Darn, that grass is tough stuff to cut and grows soooo rapidly. 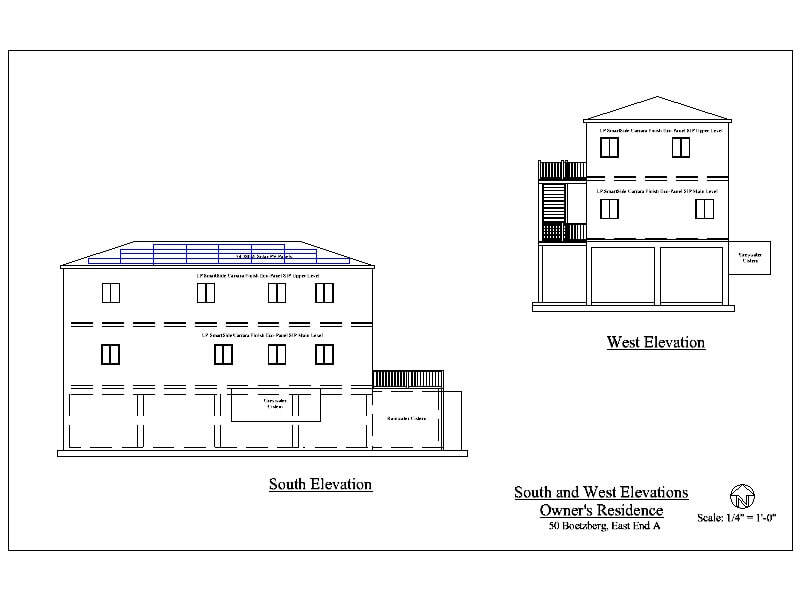 Below are my drawings for the front complex, which will contain my residence, the rum cake kitchen for Kenny's wife's Crucian Rum Cakes, a common laundry for both my residence and their future residence (the final phase of development), and the future home of Cruzan Creations, Life in the Left Lane®, Crucian Rum Cakes, and our green products subdivision. Initially that unit is our Caribbean distributorship of Smart Plastic Technologies plastic bags and Smart™ oxo-biodegradable additive for Type 2, 4, & 5 plastics. 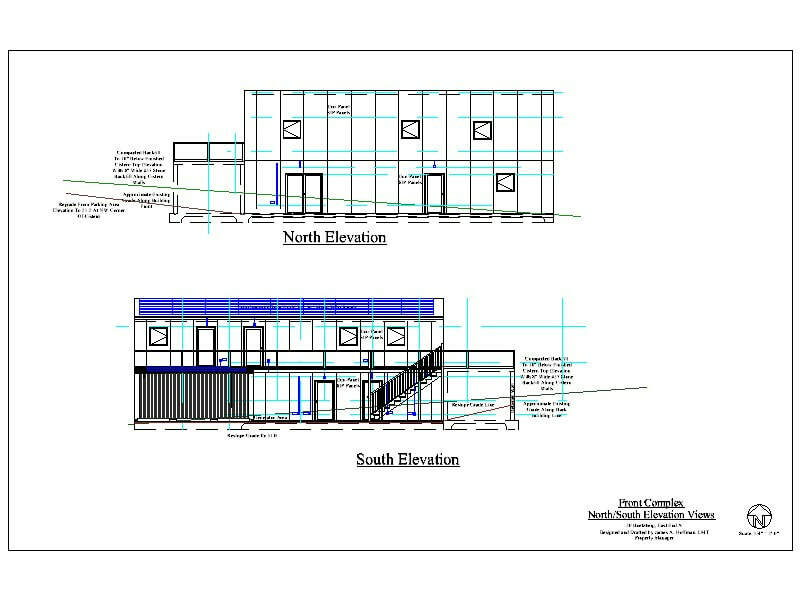 We may be adding green building products in our green line-up once we have gotten zoning clearance for the business and have Phase Two of the front complex completed. The property development is an off-grid green development. 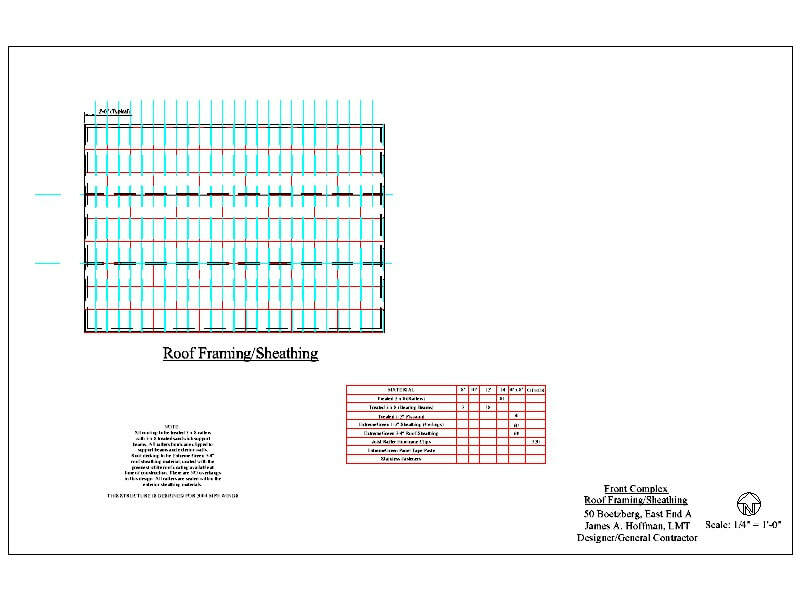 Over two-thirds of the property will be dedicated to self-sustaining fruit and vegetable gardening. I grew up on a farm and learned how to home process the food we grew. I'll be doing the same thing on this property. We will be using a combination of solar panels, battery storage, and generator as our power system. The only public utility on the property will be our EVO internet service. There will be NO septic system. Instead, we will be using the Sun-Mar Centrex 2000 composting toilet systems in both residences, combined with gray water cisterns to recycle as the water supply for the toilets and for the garden irrigation system. Our water source will be a combination of rain water cisterns and a well with UV/filter water purification systems, Drinking water and lavatory cold water will be supplied by a Pure & Secure LLC Mega 25 water distiller. At this point in my planning, I have not finalized my solar system supplier, but I'm hoping that ZappWorks has their Zapp Star batteries in mass production for the back-up system, combined with Redox Energy's 25KW Fuel Cell Generator (again, I'm awaiting their mass production entry into the market). I've selected the Rheem hybrid heat pump hot water heaters for our hot water systems. After much research, I’ve finalized my exterior wall systems to be Eco-Panel SIP panels, with ExtremeGreen MgO wall sheathing for the interior wall finish, their MgO sub-flooring for the residential main floor, and their MgO roof sheathing. The only concrete on the property will be for the cisterns, slabs, and the future carport for Kenny's residence. All drive/parking areas will be "paved" with the NDS EZ-Roll Gravel Pavers for a totally permeable drive/parking area. I will be utilizing as many green building products as I can find throughout the development. Because I don't like "enclosed" cabinets or closets here in the tropics, all kitchens will have "floating" quartz countertops and ClosetMaid open shelving above and below the countertops and all storage areas will also be open shelving rather than closets. Yes, my home has a spa with its own separate entrance. That is so that my friends who want a spa treatment don't have to go through the entire house. There will be a three-person outdoor hot tub, 4-person infra-red sauna, plus my massage table. IF Kenny's one son completes his planned chiropractic training and decides to move back to St. Croix, I've made provisions within my home for his chiropractic clinic which is also accessible directly from the main entrance hall that also serves as the entrance to the future commercial wing. Once we start construction, I'll be posting progress reports and photos on this page, as well as the links to the other product manufacturers chosen for the project. We hope to still break ground before the end of the year, with my residential area completed no later than 11/15/19, my "diamond day" birthday gift from Kenny and his family. NOTE 4/4/18: Thanks to Irma and Maria, two Cat 5 storms within two weeks, I have been in the process of totally redesigning the Front Complex (and will be doing the same for the owner's residence down the road) to SuperStorm building methods (to withstand 200 mph winds.) Due to my optional SIP manufacturer currently concentrating their efforts on production of their ExtremeGreen MgO sheathing material, I'm back to designing with Eco-Panel SIP's out of North Carolina. 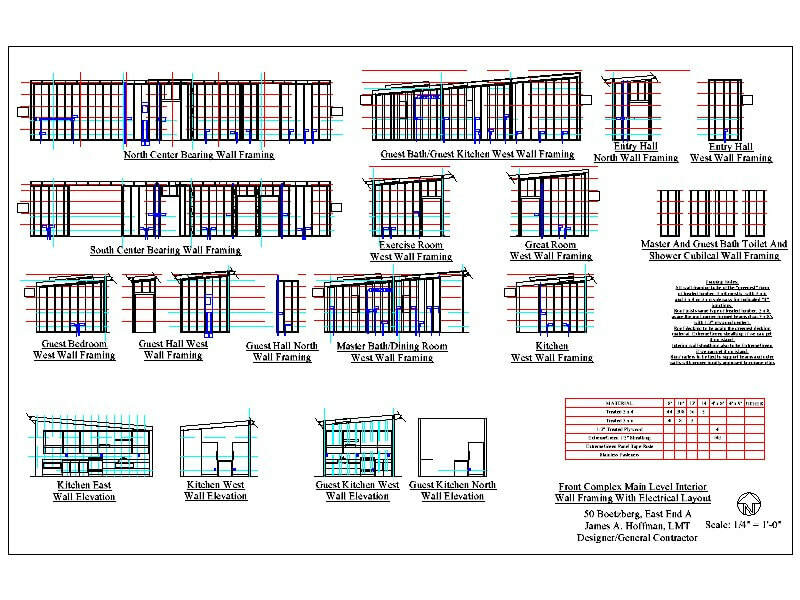 I've gone from the 4 ½" panel to 6 ½" panels to get the 200+ mph wind design and have gone from a 56' x 32' design for my residence to a 48' x 36' layout (too difficult to get good quality 16' 2 x 12 treated lumber for floor framing and roof framing.) Roof rafters do NOT extend beyond the exterior skins of the SIP wall panels, but are sealed within those outer skins and the roof sheathing. 7/2/18 Update: The more I thought about having part wood and part concrete floors within my residence, I decided to totally redo the layout for the front complex. The rain water cistern is now part of the future commercial wing and the manager’s residence now has all wood floors for the main level (I hate concrete floors for standing long hours, such as at the stove canning, etc.) There is now an interior stairway to the lower level and the Spa area has been moved to that lower level with the hot tub in the back lower level gallery. This will afford more privacy for the Spa usage. I’m still working on revising a lot of the drawings, so the plot plan and drive layout drawings shown here are not yet updated. 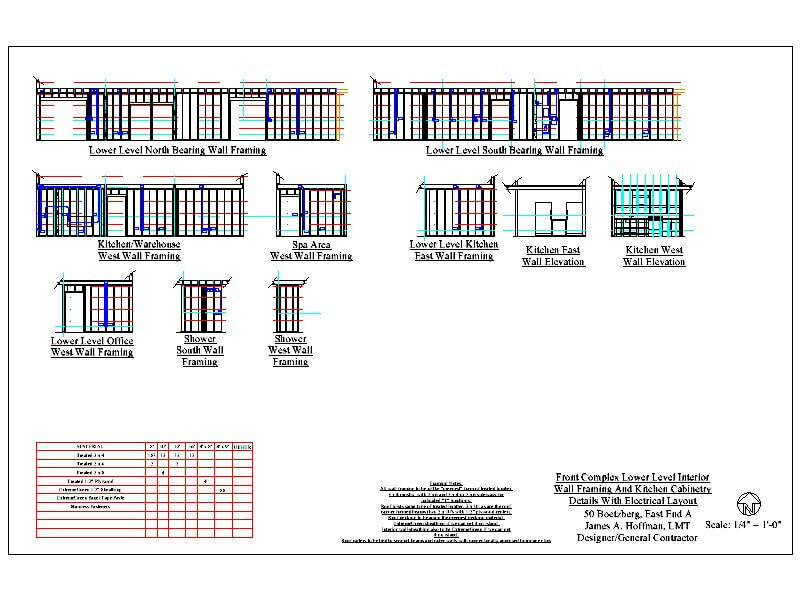 The Front Complex lower level and main level floor plans and the Elevation drawings are current as of today. 8/5/18 Update: Oh, I never should have started this project...I keep changing my mind the more I look at layouts. 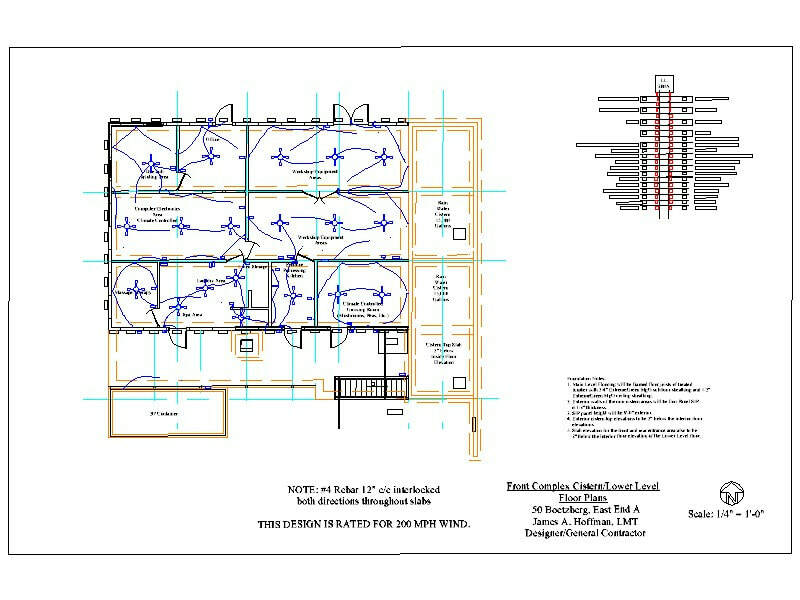 I just spent the last two days totally redoing the Front Complex layout, eliminating the eastern commercial wing, expanding the residential wing from a 52’ x 36’ layout to a 68’ x 36’ layout with the commercial “wing” now located in the lower level. 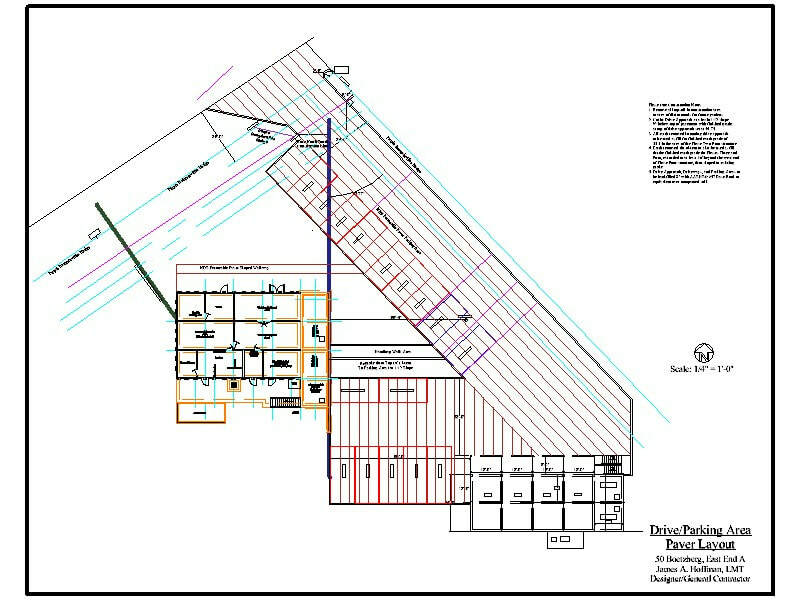 Posted today are the revised drawings for the plot plan, the drive/parking layout, the lower level dimensional and floor plan view, the main level dimensional and floor plan views, and the north/south and east/west elevation views. Over the next several days, I’ll be revising all of the other Front Complex drawings that are currently posted here and updating those files here on the blog. You will note that I no longer show a gray water cistern. That is because I’m now planning to use a gray water treatment unit from www.rainwatermanagement.com. This unit will filter all of the gray water of lint, hair, etc. and then treat it before it is pumped to the toilets and irrigation system. 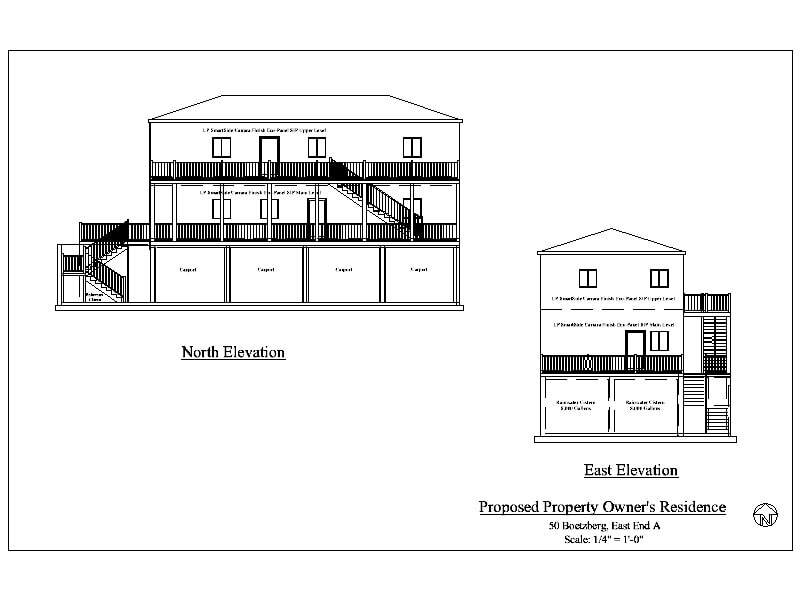 That unit will be added to the lower level plans as soon as the vender finalizes the unit size and dimensions. 8/10/18 Update: In the past five days, I’ve updated several more of the drawings to conform to the new 68’ x’36’ design. I’m still finalizing the lower level electrical, the plumbing details (awaiting the design from Rainwater Management for the gray water system), and the concrete structural details (rebar sizing and spacing, etc.) 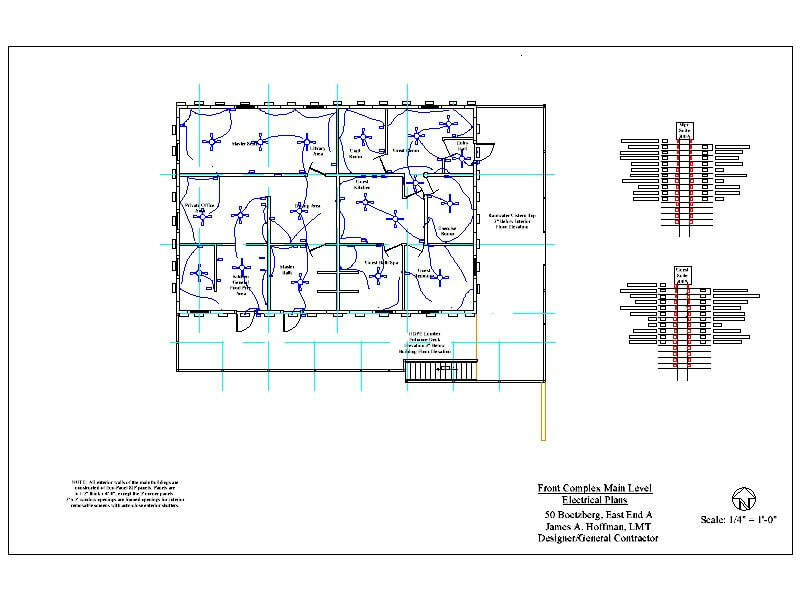 The electrical and plumbing drawings shown here are my draft stages for those two drawings. 8/13/18 Update: After lengthy discussions with my contact at Rainwater Management and Kenny Lindquist, the owner of the property, I’ve spent the last four days once again doing a major redesign of the Front Complex. Who knew that by researching the greenest, lowest maintenance, and long-term cost effective building products on the market at the time, it would become a real challenge and educational opportunity. But, once we start construction, I hope my research efforts pay off in terms of helping to educate others on how to design and build for total 0ff-grid/Green/Self-sustaining lifestyle. 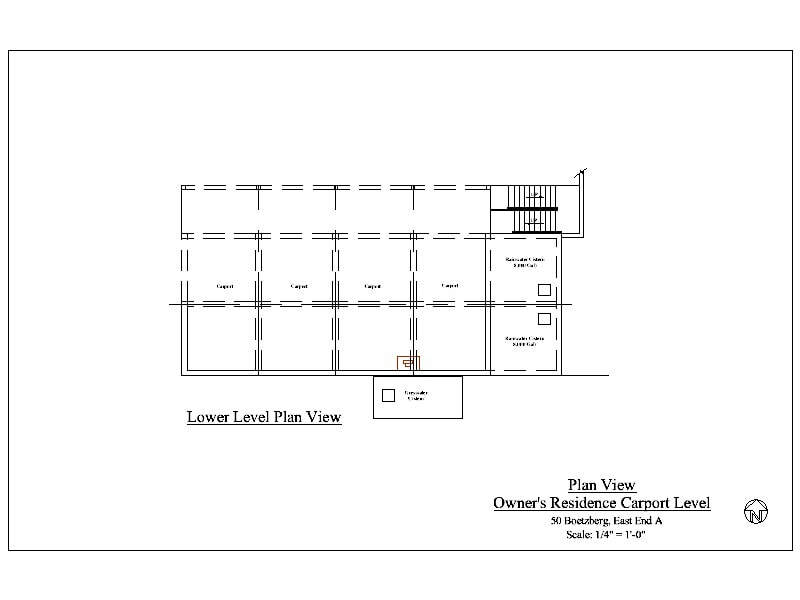 I am uploading the revised lower level and main level dimensional floor plans now. Over the next few days, I’ll complete the modifications of all of the other drawings and post the new files here. 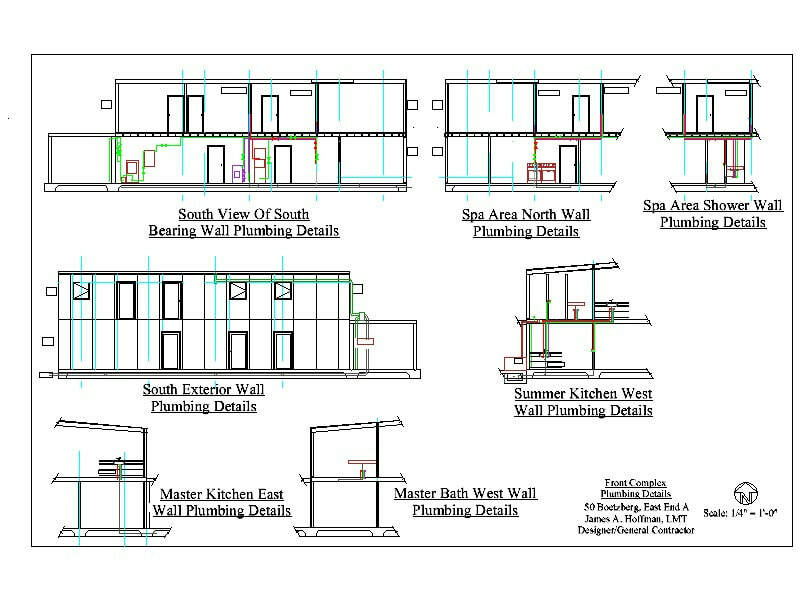 I have gone back to the 52’ x 36’ design with reinforced poured concrete cistern walls. The cost of shipping a 20000 fiberglass storage tank for the rainwater collection system, plus the fact that the tank manufacturer’s design specifications would require a hole at least 15 foot deep (a seven foot ground fill over the tank is required), sent me back to the poured-in-place concrete structure. 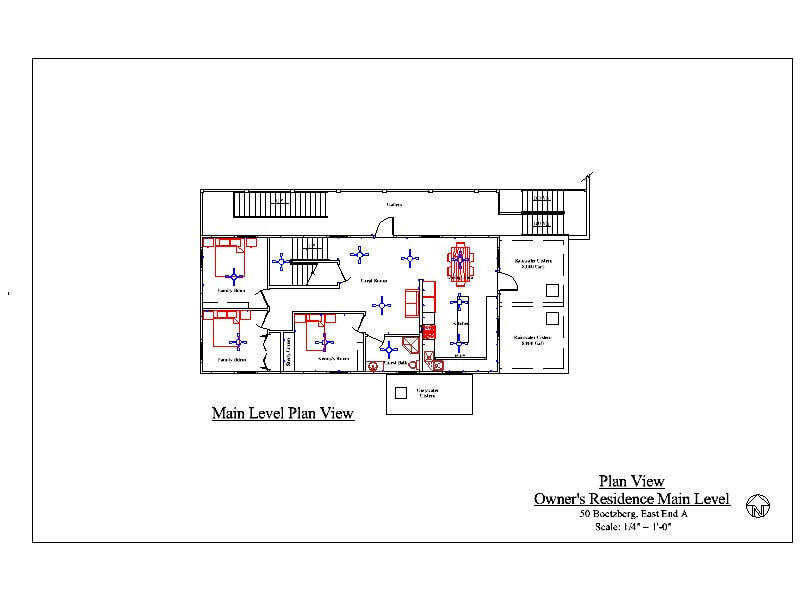 1/3/19 Update: Over the last couple of months, I have revised the lower level floor plan, so here is the latest dimensional and floor plan layouts. 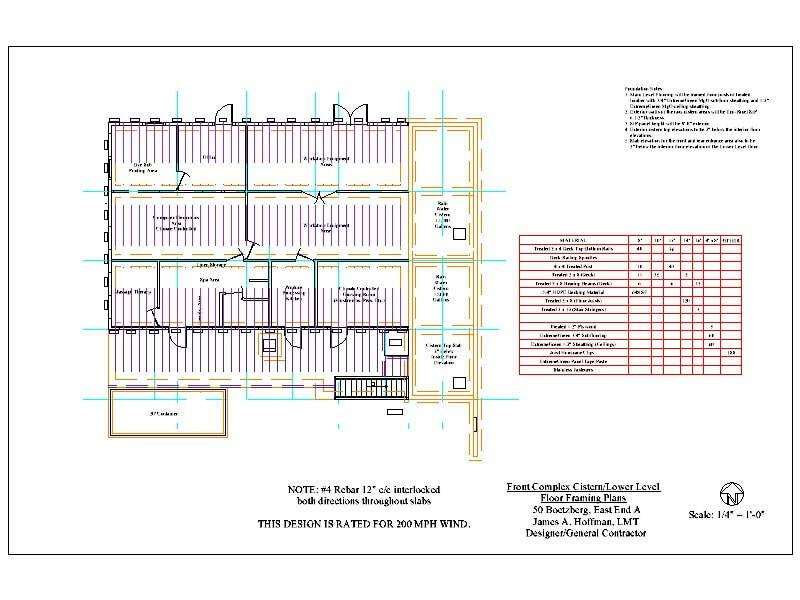 I still have to update the electrical layout, framing details, and interior and exterior SIP panel/elevation drawings to conform with the latest lower level layout. I hope to finish those in the next few days. We are still hoping to start construction later this spring in order to have me living in my residence by my Diamond Day birthday 11/15/19. I did finally manage to confirm with VIYA, my internet provider, that they do have an underground fiber optic cable running on the other side of East End Road that I can tap into, instead of having to run from the arial EVO line along the back property line through 250 feet of underground conduit. This, hopefully, will provide us with “uninterrupted” internet service should we experience another “Irmaria” type back to back 185+ mph hurricane situation like in September 2017. 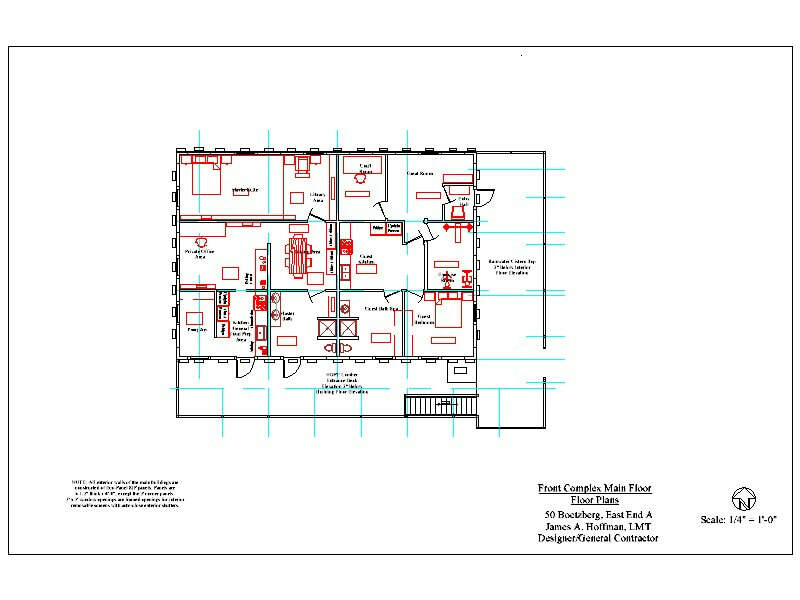 1 /27/19 Update: Well, after discussing potential printing equipment with Kenny, and making sure that I can get that equipment into the building, I’ve basically gone back to the September 2018 lower level floor plan with a couple minor changes in the spa area and the laundry/equipment room, so I will be gradually updating the drawings again. 2/3/19 Update: Posting of updated drawings for the latest changes in the lower level layout. 3/24/19 Update: Several changes underway. 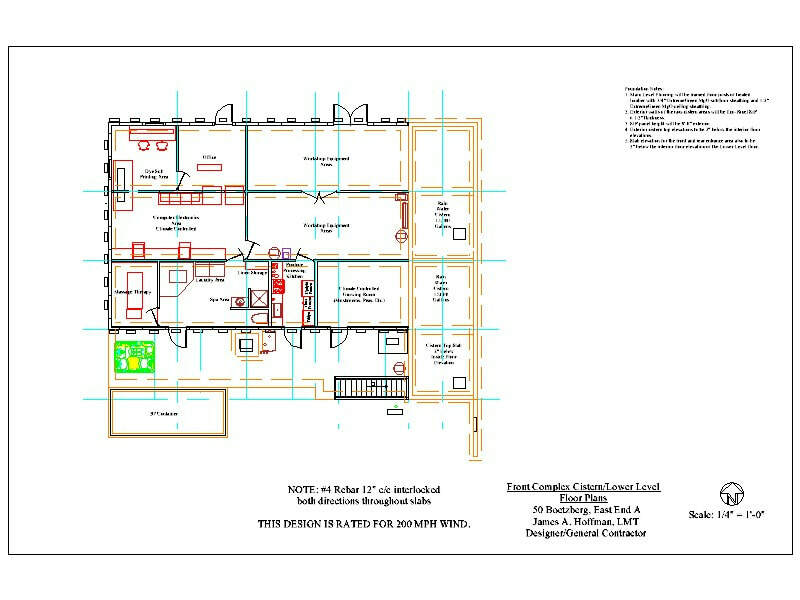 Plot Plan needs to be updated per today’s changes in Drive Layout, Lower Level Floor Plan, and Main Level Dimensional and Floor Plan. I’ll be updating the rest of the files over the next couple of weeks to reflect today’s layout changes. 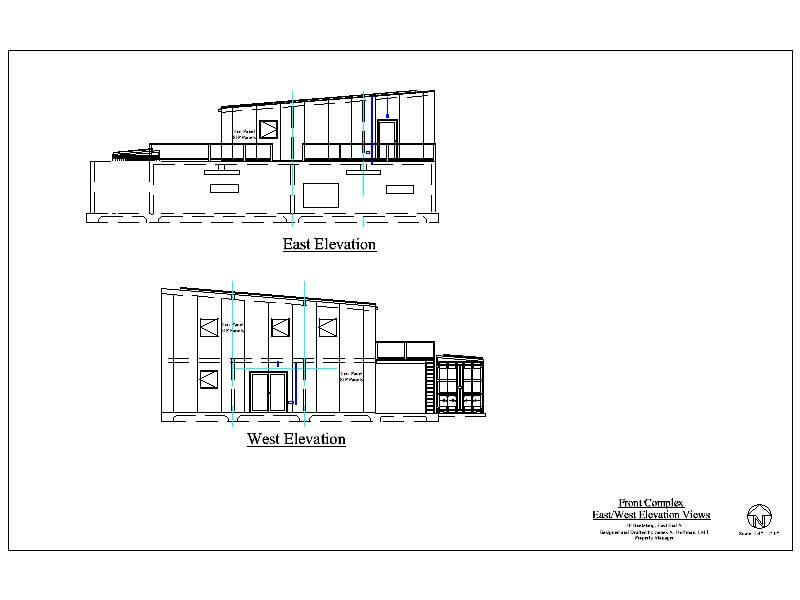 4/4/19 Update: Revised Drive Layout, East/West Elevation, and North/South Elevation drawings. 4/7/19 Update: I just finished redoing the Front Complex Foundation/Cistern Sectional Details. I also just realized that somehow I had not yet posted the link for the Tub-Bar Glass Fiber Reinforced Polymer (GFRP) rebar that I’ll be using instead of steel rebar (to avoid corrosion deterioration within the concrete foundation/slab/cistern walls.The Plot Plan has also been revised to match the Drive Layout. 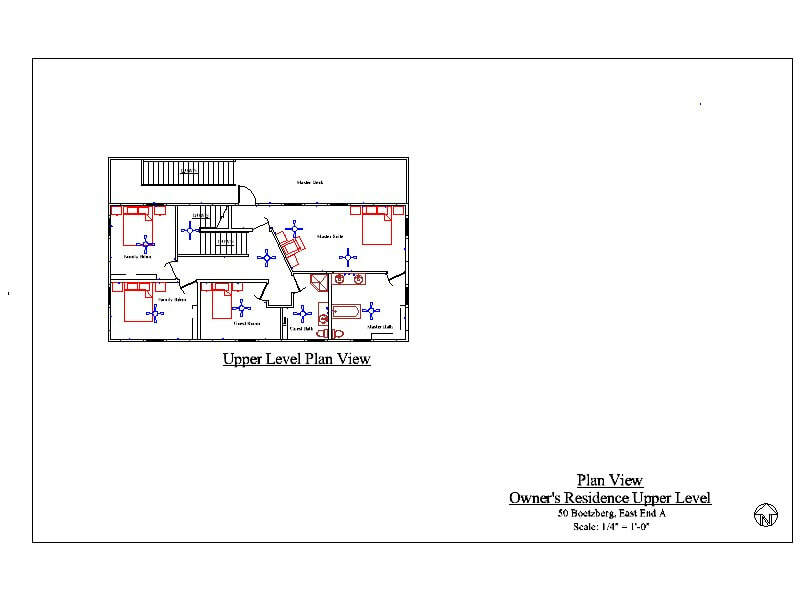 4/14/19 Update: I think that I should now have completed all but the drive-parking layout for the lower level interior changes front complex main floor electrical plan revisions for the cistern and exterior stairway modifications, plumbing detail drawing and verification of the interior and exterior electrical locations of the Eco-Panel SIP’s. 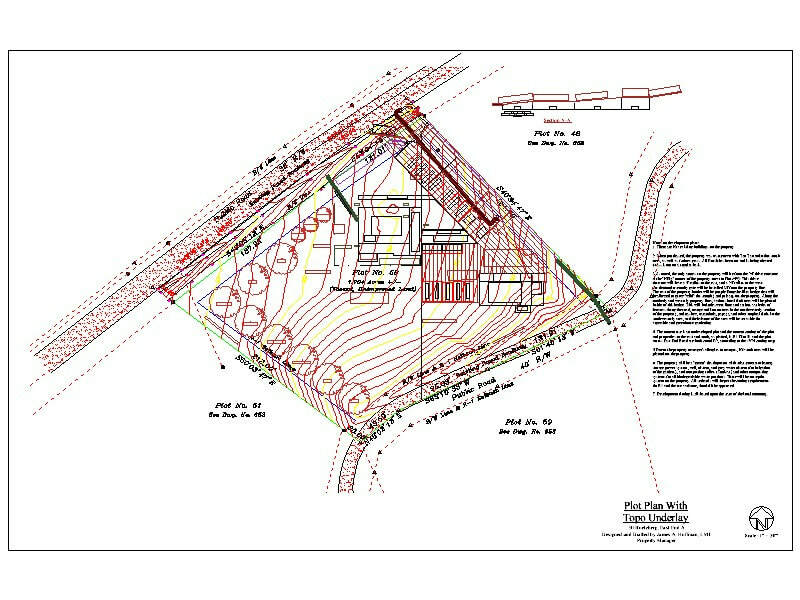 I hope to finalize those drawings by Thursday, and then I will be verifying grade elevations for the front complex and drive/parking area back to the owner’s residence sometime over the weekend. 4/17/19 Update: I still need to review all front complex drawings to make sure that all changes conform on each of the related drawings, but today’s postings should have them updated. My next step will be preparing the complete material list for the development of the Phase One Front Complex development. Phase Two will be the completion of the rear drive/parking area and the owner’s residence, as well as the final landscaping. Once we start construction, I’ll be posting photos of the work progress. If you are visiting the island and want a tour of the development project, contact me and I'll arrange to meet you at the property (it's on the way to the Buccaneer Hotel).